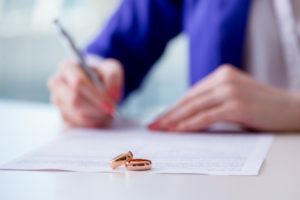 In Florida, any couple wishing to define their respective property rights in the event of a divorce, separation, or annulment, may enter into a Prenuptial or Postnuptial Agreement. This agreement is a binding contract, like any other legal contract. It is also subject to some particular family law rules regarding what type of provisions will actually be enforced should the agreement be contested later on. Therefore, it is extremely important for both parties entering into this type of agreement to have legal representation and receive the correct legal advice when doing so.